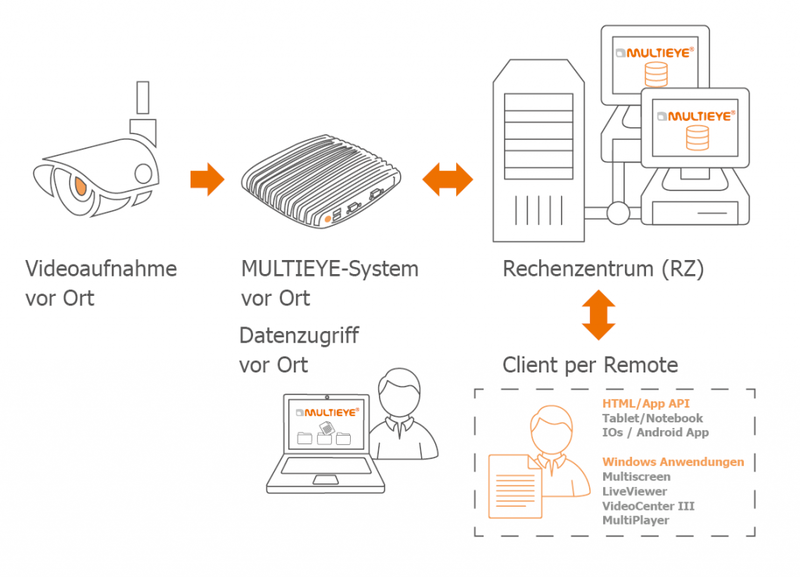 The MULTIEYE Law Enforcement Video Surveillance Management System is a complete video surveillance platform, specially developed for security agencies, consisting of mobile video recorders with LTE transmission, proxy servers with central recording, configuration servers with LTE transmission � and administration servers as well as mobile and stationary monitoring stations. An outstanding feature of the system is its central equipment management, administration and application-specific configuration and compilation of mobile recorders, LTE routers, video cameras and VPN settings via predefined presets. The user rights for live access and subsequent evaluation of the video data are also centrally administered and remotely configured. This means that the entire configuration and administration of the systems and monitoring stations used are initialized remotely at the push of a button. The police forces no longer have to deal with IP addresses and configuration details of devices and components - they can concentrate fully on the operation. If the LTE connection is not available, all settings can be locally configured. In order to be able to manage with the available bandwidth even in larger operations with several live viewers in a limited mobile connection, the control center acts as a proxy for all video streams, which thus only have to be called once by the mobile system in use, regardless of the number of viewers. Complete application scenarios can be covered with our system. Equipment requirements and operations can be planned in advance via the clearly web pages layout. At the same time, an overview of all deployments with the associated records is possible via the website, whereby access to the recorded data is logged. In addition there is the possibility to integrate further software and hardware modules and tools from MULTIEYE, such as IO Server, license plate and face recognition, VCA video analysis.